To understand what is meant by a bunded oil tank, we to know what a bund is. A bund is a containment system that stops fuel from escaping the tank. With oil tanks it is essential that they are bunded in some way in order to prevent oil leaking into the environment. This means you can either construct a bund for the oil tank to sit in, or buy a bunded oil tank – a tank with two skins. Bunded tanks are effectively a tank within a tank that have the capacity to hold the oil if the first skin were to split or break. If you are buying a single skin tank you would need to construct your own bund, this is why bunded tanks have become very popular. What are the benefits of oil storage tanks? Having your own oil storage tanks means that you are not dependent on the national supply and are not at the mercy of their pricing structures. This is another step along the road to self-sufficiency. It also gives you the option to take advantage of price fluctuations. You can buy oil in bulk when prices are low and not have to spend when they are high. Which material is best for oil tanks? Oil storage tanks are available in either plastic or steel. Each have their own advantages and disadvantages and it may come down to your specific needs as to which might be best for you. Steel tanks are becoming the most popular thanks to their durability, longevity and value for money. They tend to be more secure and resistance to wear and damage, and need replacing less regularly. Are there any restrictions on where I can place my tank? Yes, there are restrictions that you need to be aware of. You oil tank needs to be situated no less than 1.8 metres away from a building, at least 0.76 metres away from non-fire resistant boundaries (for example, a wooden fence) and at least 0.6 metres away from any other screening than does not form a boundary (for example, plants and trees). Are oil tanks suitable for residential properties? Yes, definitely. There is something of a misconception that oil tanks are only used either in industrial or agricultural settings. But oil tanks are becoming more common at private residences too. 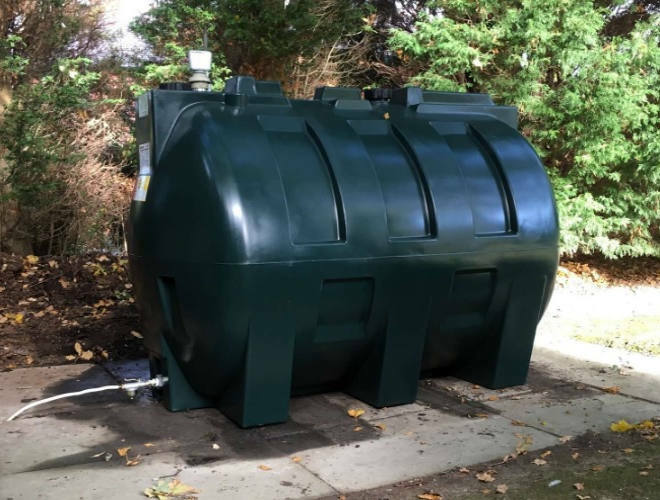 Buying a domestic oil tank can provide your home with oil, and we are seeing many properties choosing this option. Does an oil tank require maintenance and servicing? It is best practice to have your oil tank properly maintained with regular servicing and basic maintenance. Getting your tank serviced regularly is inexpensive compared to the cost of having to repair or replace an oil tank, so it’s worth investing in proper maintenance. How long do oil tanks last before they need replacing? With good maintenance, oil tanks will last many years before they need to be replaced. It’s generally the case that steel oil tanks last longer than plastic oil tanks. We offer DESO plastic tanks that come with a 2 year warranty, while our own custom steel tanks come with a 5 year warranty.